(1956) Casa Vega, Sherman Oaks | Remains of L.A.
-The bar was stunning, with colored christmas lights and a sort of canopy sign with drinks written in script. The rest of the restaurant was dark rooms with white christmas lights, brick walls, hanging lamps that looked like lace made of metal, large vases of fake flowers everywhere, and giant oil paintings on the walls. The paintings in our area were mostly of bull fights, which was a huge bummer. -I got the combination with a chicken enchilada, a chicken tamale, refried beans and spanish rice, and chicken tortilla soup. It was all good except I wasn’t crazy about the chicken. David (my husband) and I shared something called chopped guacamole, which was incredible, much thicker than regular guacamole and absolutely delicious. Kind of hard to get onto the tortilla chips, but worth the effort. There was also tortilla chips and salsa, of course. The chips that came with the guacamole were different than the ones already on the table, kind of puffier, and at first I liked them a lot more but then I started to get sick of them and just wanted to go back to the usual kind. David (my husband) finished my soup for me–I was trying to keep room for the main food–and I didn’t end up eating all that much of that, either. I almost always think I’m hungrier than I am, especially when there are chips on the table. -David (my husband) got a drink called a Mexican Mule, which is like a Moscow Mule but with tequila instead of vodka. I love the names of cocktails. I don’t drink alcohol, but if I did I would constantly order the most ridiculous sounding cocktails I could find. If I ever get a regular bar I might bribe the bartender to just give me club soda with food coloring and the appropriate garnishes no matter what I order, so I can have the pleasure of ordering outlandish drinks. -Standing near the entrance, apparently waiting for a table, was a tall skinny guy in a police uniform. I suppose he was a policeman, but something about his lanky frame, combined with his horseshoe mustache, made it look like he was a guy in a ridiculous cop costume. 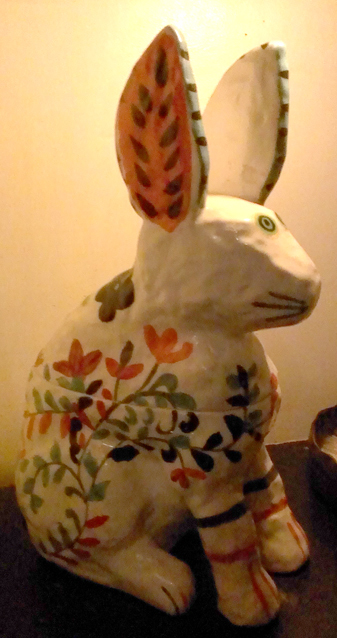 -On the other side of the bar there was a niche in the wall that held a little ceramic bunny rabbit, painted white with flowers. When I first saw it a mother was showing it to her toddler and the toddler clearly wanted very much to eat it. -The restaurant was very crowded and loud. We all said “what?” about thirty thousand times throughout the meal, and also all wrestled with the temptation to say “never mind” rather than repeat the inane thing we’d just said. -David (my husband) and Corey had a friendly argument over what “carnitas” means and I looked it up and Corey was right–it’s pork. Then Corey, who usually sticks to burritos, asked what the difference between an enchilada and a tamale was and David (my husband) explained it to him, so they were even as far as I was concerned. -Across from our booth was a booth with four people crammed into it. Three of the people were very gregarious and large and loud. A fragment of story I heard the older woman tell: “so she was drunk, sobbing, with her shoe in her hand, the heel off, and she was literally hysterical…” The fourth person in the booth, sitting between the younger man and the aforementioned older woman, was a thin young lady, her shoulders hunched, smiling uneasily. I don’t think she said a word the whole time; she didn’t have to, the way the others talked and shouted and laughed. I’m pretty sure it was a Meet the Parents situation. When we stood up to leave my eyes met hers and I wanted to offer her my hand, give her an escape route. But I didn’t. -Back by the bathrooms was a seating area with much prettier paintings than the red and black matador pictures near us. These were all greens and blues and tans, pictures of a village. There was one, of a tree and some stairs, that I just adored. I wished we’d been seated back there so I could look at it while I ate. 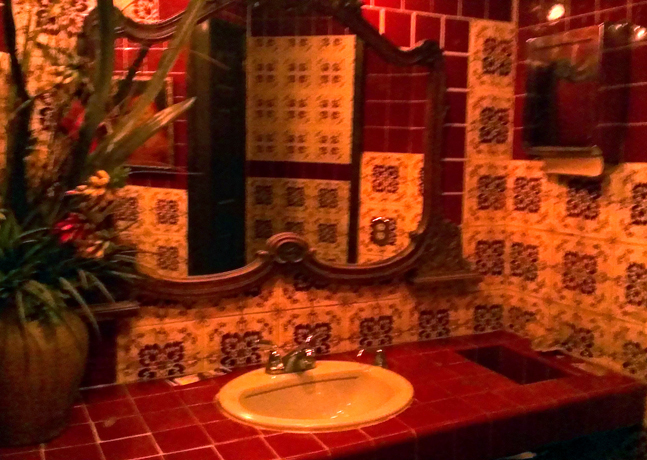 -The ladies room was charming, complicated patterns of red and white tile. In the stall was a coat hook that looked like an ivory ladies fan. -By the bar was a well-dressed man with a pompadour. It looked so great. I really hope this means pompadours are coming back. -There was a bit of an issue with the bill–it turned out we’d been given the lunch menu, with lunch prices. But when we asked about it, they quickly changed the bill to reflect the prices we’d seen. -In the entrance way were some black-and-white photographs. One was a street shot of Casa Vega long ago, but there was no date. That drives me crazy; what’s the point? I thought about asking the hostess if she knew, but it was so loud and busy I didn’t want to trouble her. Who I Ate With/Things We Talked About: David (my husband) and our friend Corey; the time David Letterman hosted the Oscars, a podcast David (my husband) loves called The Flop House in which they review bad movies, The Happiest Millionaire, a movie I love that the Flop House Podcast was so wrong about (they’re mostly right, David [my husband] says), various Hollywood Fringe shows we have seen or are excited about seeing. What Sort of Ghost I’d Expect to Find if I Believed in Ghosts Which I do Not: A woman with a red flower in her hair who would sit at the bar and drink cocktails with fascinating names; all the men wanted to flirt with her but she had eyes only for the bartender. The writing is so great! 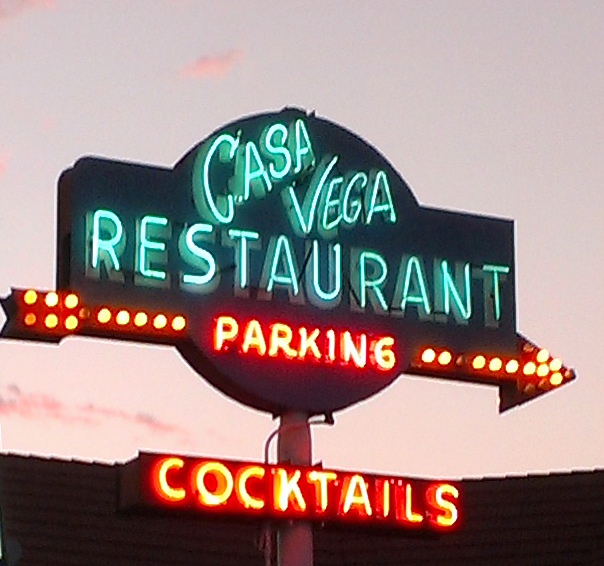 I can’t wait to go to Casa Vega; it’s been years. I want to go see and taste what she wrote about. I advise not going Friday or Saturday night. The crowd was noisy and the waiter was hostile. The Mexican Mule, despite it’s name, was a tasty drink and not a latino who had swallowed condoms filled with heroin to smuggle them across the border. Legendary for it’s relationship to the smarmy side of Valley showbiz (well…is there another side I don’t know about? )…..surprised there isn’t a casting couch in the back. Actually, there might be. no, it’s not. it’s your style! you’re always a joy to read.